Passages to the Past: Happy Easter!!! I would like to wish all of you a very happy Easter!! May it be filled with family, friends, love and chocolate!!! 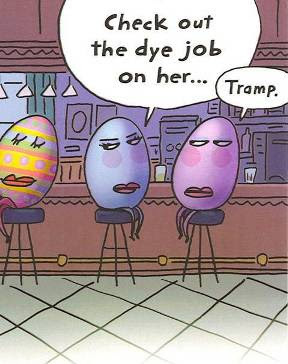 Love the eggs, so funny! That cartoon is too funny! Happy Easter, Amy. Happy Easter to you! Wishing you a lovely holiday. (P.S. For giggles and possible happy tears, don't miss the 4-minute video I posted purely for feel-good reasons! )I wish I could share this with everybody! This had to be my most fav funny of the season.. Happy Belated Easter to you too.